Learn More About Outdoor Solar Lights and Garden Products – the best customer is a well educated consumer. 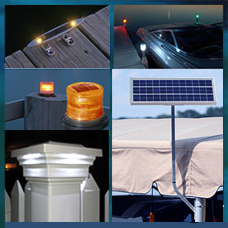 Just some of the new products now in stock at SolarFlairLighting.com: solar boat and dock lights, solar marine chargers, high-end fence cap solar lights and more! This entry was posted in What's New and tagged outdoor solar lights, sale on quality solar lights, solar boat lights, solar garden lights, solar lamp posts, solar lamps, solar lanterns, solar marine lights, solar navigation lights by SolarLightingSmart. Bookmark the permalink.